It's no secret that what separates Pinterest from other social networks is the unique ability to get people to buy things. Sure, other networks are trying to do the same thing, but Pinterest is one of the best at it. Now the company has launched a series of new features to make that even easier. The coolest, and most interesting, thing the company introduced was the addition of automatic object detection to visual search. In November of last year, Pinterest debuted the ability to zoom in on and select objects in a photo, which they could then search for. For example, if there was a picture of a table, they could zoom in on a lamp in the corner instead, to find out where to buy it. Now Pinterest will do that automatically, meaning that when someone opens a photo, they will right away see a list of all the items in the image that they can search for. "Since an image can contain dozens of objects, we wanted to make it as simple as possible to start a discovery experience from any of them. In the same way auto-complete improves the experience of text search, automatic object detection makes visual search a more seamless experience," the company wrote. "Object detection in visual search also enables enable new features, like object-to-object matching. For example, say you spot a coffee table you love either on Pinterest or at a friend's house, soon you’ll be able to see how it would look in many different home settings." Even cooler: Pinterest is developing technology so users can do the same thing in the real world. All they'd have to do is take a picture of something, and Pinterest will give them a recommendation on where to find it. They would even do the same thing for multiple items in the same photo. Pinterest has been numerous acquisitions in the visual search space, having bought VisualGraph, followed by visual organization tool Icebergs, both in 2014. 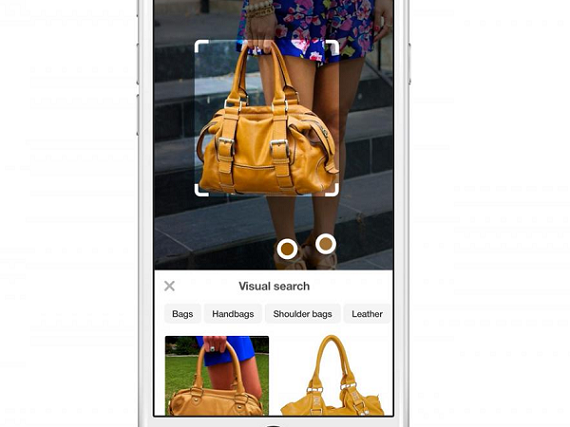 In addition to the new visual search, Pinterest also announced that it is launching Buyable Pins on the Web. Buyable Pins, first introduced last summer, allow users to find things for sale. They have a blue price tag and are discoverable through the home feed, category feeds, search results, recommendations, boards and The Pinterest Shop. Users can search for Buyable Pins, filter by price and, once they find one, they can scroll through high quality images, select their size and color, click Buy It and pay with a credit card, right from the Pinterest app. The company said it is expanding them to the Web because 84 percent of people shop from their phones and the laptops. In addition, Pinterest also introduced a new shopping bag, which will allow them to that add things on different devices, and from different merchants. The company plans to roll all of this out ahead of the upcoming (oh no, are we really doing this already?) holiday season. Recently, buy buttons have become a trend on social networks. Last year, Facebook partnered up with Shopify to allow its merchants to advertise and sell their products, before it announced a new Shop section, or a single place where users can "more easily discover, share and purchase products." It will be tested with a limited set of small businesses. In October, it launched a dedicated shopping feed, as well as new ad formats dedicated to allowing users to buy goods. In September of last year, Pinterest debuted the Pinterest Shop, which features collections from different brands, including big stores like Bloomingdale’s and Nordstrom, as well as small boutiques like The Citizenry and Heist. These are curated collections, ones that will be hand-picked by employees at Pinterest.